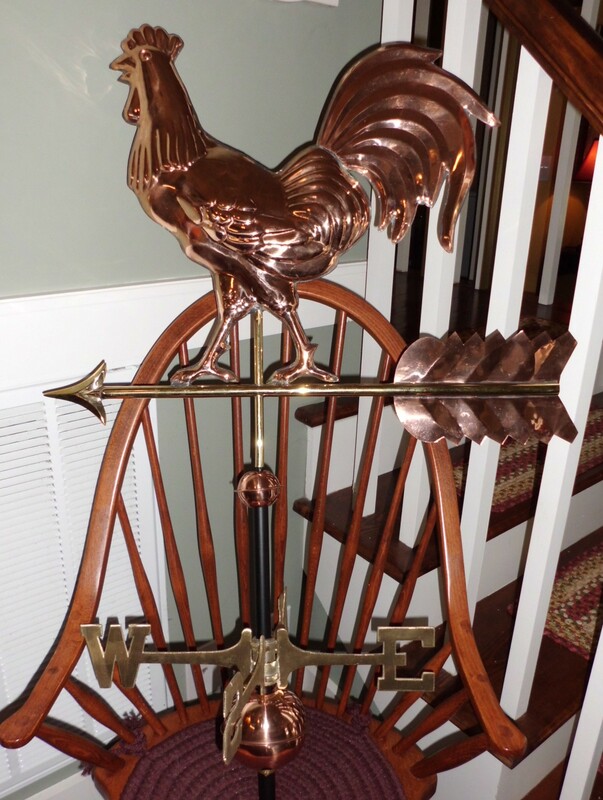 I’ve been looking for a chicken weathervane for a while. A particular website sells some really beautiful ones but I was reluctant to buy one without seeing it in person. Plus, this place is pretty pricey and I was having trouble nagging asking Jim to buy one for the house. Then, in an odd twist of fate we were driving on Hwy 1 along the southern coast of Maine, when I spied a shop on the side of the road with the exact weather vanes I’d been coveting for months. Weathervanes of Maine was indeed the very place. I yelled, “Pull over, pull over!” and Jim felt his wallet shiver in his back pocket. I was actually drawn first to the cute flying pig until I saw this chicken displayed on the showroom wall.